“Knight’s Move”was performed on Thursday 9, Friday 10, and Saturday 11 April, 1953, at the Theatre Royal. C. Vesperman, A. E. Bragg. 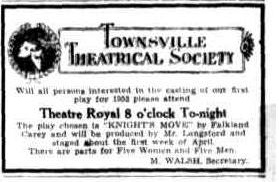 Townsville Theatrical Society goes on from success to success, in the Theatre Royal last night, the first production of the season was presented, and it proved a triumph for the players and all concerned with the play. 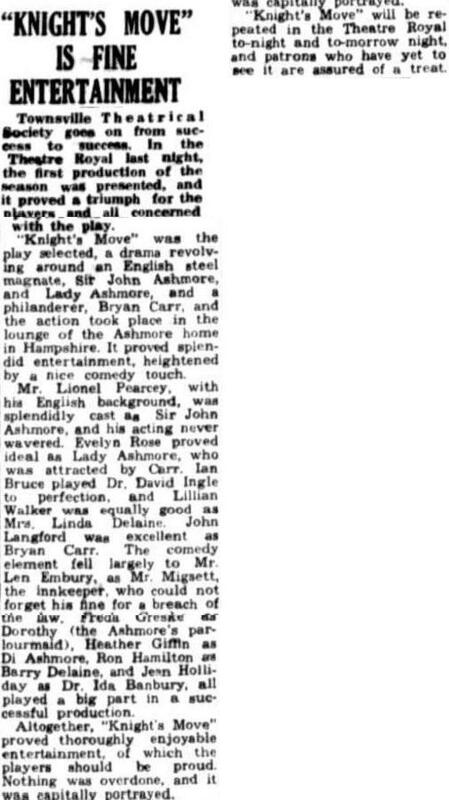 'Knight's Move' was the play selected, a drama revolving around an English steel magnate, Sir John Ashmore, and Lady Ashmore, and a philanderer, Bryan Carr, and the action took place in the lounge of the Ashmore home in Hampshire. It proved splendid entertainment, heightened by a nice comedy touch. Mr. Lionel Pearcey, with his English background, was splendidly cast as Sir John Ashmore, and his acting never wavered. Evelyn Rose proved ideal as Lady Ashmore, who was attracted by Carr. Ian Bruce played Dr. David Ingle to perfection, and Lillian Walker was equally good as Mrs. Linda Delaine. John Langford was excellent as Bryan Carr. The comedy element fell largely to Mr. Len Embury, as Mr. Migsett, the innkeeper, who could not forget his fine for a breach of the law. Freda Greske as Dorothy (the Ashmore's parlour maid), Heather Giffin as Di Ashmore, Ron Hamilton as Barry Delaine, and Jean Holliday as Dr. Ida Banbury, all played a big part in a successful production. Altogether, 'Knight's Move' proved thoroughly enjoyable entertainment, of which the players should be proud. Nothing was overdone, and it was capitally portrayed. 'Knight's Move' will be repeated in the Theatre Royal to-night and to-morrow night, and patrons who have yet to see it are assured of a treat.